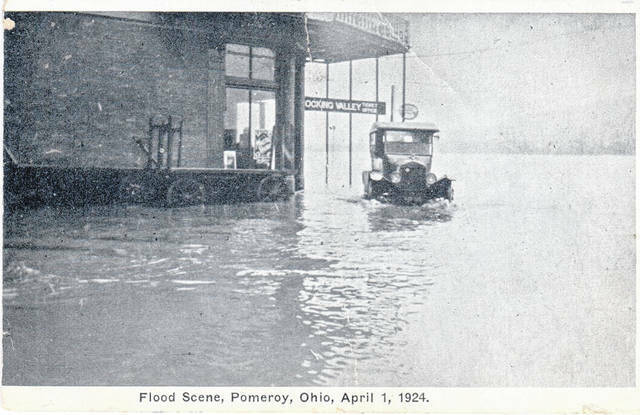 This postcard photo provided by Marge Reuter shows a Model T sitting in flood waters along Main Street in Pomeroy near the Hocking Valley Railroad Ticket Office. The date on the bottom of the postcard reads April 1, 1924.
https://www.mydailysentinel.com/wp-content/uploads/sites/14/2018/10/web1_11.1-Hocking-Valley-Rail-and-model-T_ne20181031164559222.jpgThis postcard photo provided by Marge Reuter shows a Model T sitting in flood waters along Main Street in Pomeroy near the Hocking Valley Railroad Ticket Office. The date on the bottom of the postcard reads April 1, 1924.